New Delhi, April 16: The Unique Identification Authority of India (UIDAI) now allows individuals to get the hardcopy of their updated Aadhaar letter in just 15 days. If a person has lost the original Aadhaar letter and wants a reprint of the letter, he/she can avail the 'Order Aadhaar reprint' facility on the UIDAI website- uidai.gov.in by paying a nominal fees of Rs 50 (inclusive of GST & speed post charges). 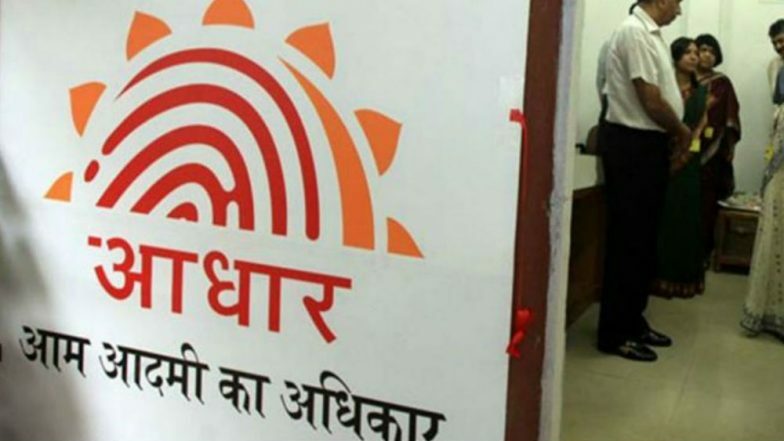 "At a nominal fee of Rs 50, you get your Aadhaar letter delivered to you via Speed Post in 15 days", the UIDAI tweeted. Aadhaar Card Holders Can Opt Out, Get Their Data Deleted As Government Looks to Amend Act. Individuals can use following payment modes to make the payment for "Order Aadhaar Reprint" including Credit Card, Debit Card, Net Banking and UPI. To order reprint of Aadhaar you may use Aadhaar Number/Virtual Identification Number(VID). The Order Aadhaar Reprint is a paid service. If you need reprint of your Aadhaar Letter post - update or due to loss of original Aadhaar Letter, you may order Aadhaar Reprint by paying a nominal fees of Rs. 50/- (inclusive of GST & speed post charges). Reprinted Aadhaar Letter will be handed over to India Post within 5 working days for delivery to your registered address via speed post. After receiving order for Order Aadhaar Reprint from the resident UIDAI will handover printed Aadhaar Letter to DoP within 5 working days (excluding the date of request). Aadhaar Letter will be delivered using SPEED POST Service of Department of Post (DoP) in line with DoP delivery norms and Delivery Status may be tracked using DoP Status Track Services. The validation will be done through a One-Time-Password(OTP), which will be sent to your Registered Mobile Number with Aadhaar database. If an individual wishes to use TOTP, it is advisable to use m-Aadhaar Application. Aadhaar Profile on mAadhaar App Can Be Used for Identification Purpose by Airports Authorities and Indian Railways. According to details on the UIDAI website, to order your reprinted Aadhaar card, it must be noted that your mobile number must be registered with the Aadhaar database as a one-time password (OTP) will be sent to that number. Here's How to Link Aadhaar Card to PAN Card in Easy Steps Before March 31. In case if no mobile number is registered with the Aadhaar number, then the individual may get your Aadhaar card reprinted via a non-registered number. In case of the latter case, individuals will not be able to preview the details. Individuals can track using the Airway Bill Number (ABN) which is generated by DoP i.e. India Speed Post for the assignment/product that they deliver.